Please sorta-kinda ignore the errors in this one; I kinda doodled it pretty fast so I'm sure there are a few things off. But whatevs, it was a load of fun. So much so that I think I may do some AppleDash and PinkieShy.... Maybe. ..... Yeah. So I should probably get to sleep. BUT YOLO AND SLEEP IS FOR WIMPS AND SUCH. "...N-No, but what you can do to me has me nervous." Okay, I love your art to death, and I feel really inspired to write something within the universe of your Bodyguard AU. 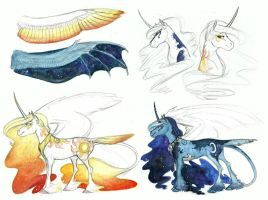 Question: what interaction do Celestia and Luna, as literal goddesses, have with the mortal ponies? As goddesses, they have the power to interact with mortals at any given time however they are very selective in whom they choose to appear to. The most they typically do is give some sort of tangible sign that they are aware or that they are present, or if they approve of something. 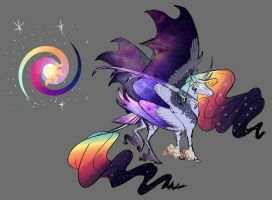 For example: if a bunch of ponies are praying in the Temple of the Moon and offering gifts, then Luna will sometimes allow a cool breeze that smells like the ocean and lavender blow through briefly as a show of gratitude or acknowledgement. Celestia may brighten the sun or the area will in general warm up regardless of whatever season the world is in. However, sometimes they will allow themselves to be seen when doing something profound, such as granting a prayer to a dying pony or maybe whisking a young foal from a dark place to somewhere more safe. Now, those they deem worthy of their most direct of blessings (as well as making themselves visible to at least once) will bear their marking somewhere upon their body (the most common area being the forehead). The sisters typically choose their own "champion" (or one who bears their blessing) based on whatever they feel merits it, but they also can both give a blessing to the same individual at the same time. The mark indicating the direct blessing will show up similarly to how the cutie mark does and will shine brightly when the sisters feed their Champion their power. When not in use, however, the mark will disappear and cannot be seen by anyone, not even the owner of the mark, unless they are called upon once again. The sisters are also able to revoke their blessings should they deem their previously named champion to be no longer worthy to bear their mark. "Twi, dear, have I ever mentioned how incredibly hot you look in your armor?" The snowy white unicorn slurred, batting her eyelashes seductively. Twilight didn't know how to respond. She was a trained soldier, she'd never had much of an interest in romance. "N-no, ma'am..." the bodyguard said, backing away a couple steps. Rarity stepped closer, her eyes half closed and a sly smirk sneaking across her face. "Well you look divine, Twily." She murmured. Now Twilight was really uncomfortable, that nickname was only used by those closest to her, like her brother Shining Armour and her parents. Her queen had never called her Twily before, it was either Twilight or Twi. "Your Majesty, I-I do not think-"
"Shhh, don't spoil the moment, my dear..." Rarity leaned closer to her bodyguard, stretching her neck so that her muzzle was only a few inches away from Twilight's. The soldier was blushing now, her ears moved back against her skull as her eyes darted around for an escape. Rarity's eyes were closed now as she moved even closer to Twilight. "Y-your Majesty-!" Twilight squirmed, unsure of what to do. Soon her muzzle was pressed against the queen's and Twilight found herself being pressed against the door. Rarity's small, dainty hoof moved to rest nearly on top of Twilight's larger, iron-shod hoof and the smaller unicorn leaned further into the kiss. Twilight was tense some time before she began to slowly lean part of her weight into Rarity, being careful that she didn't topple the petite unicorn with her larger bulk. Could be wrong, but Rarity looks like she is wearing lipstick. Just keep posting amazing art! And I shall work on some more. Or! even if you have a vague outline, I can work with that too if you wanted something special. Oh wow, thats awesome. But I shall see what can be done! PinkieDash will always be my favorite, but I'm actually curious about this one. How do you ship them? What your headcanon for the relationship between these two, personality and interaction-wise? As for RariTwi, I ship them pretty much however. They seem to be the type of couple who are very comfortable with one another, where they can simply sit around in each other's company without speaking and be completely at ease. Their personalities wouldn't change to accommodate the ship, if that's what you're asking, because they mesh pretty well with one another. You can even see it in the canon show, ESPECIALLY the fourth season, with how they'd interact if we're talking canon-based. Of course, I love the idea of Rarity flirting with Twilight and perhaps flustering her every now and again. backing to it, and that's where I see the bond they have as good friends coming into play. While fanfic wasn't what got me into shipping them, it certainly solidified it. The great thing about RariTwi is that, while not the most popular ship, it has a great turnaround for quality fanfiction. I honestly can't say there was a time where I've read a completely and ridiculously BAD RariTwi fanfic, and that's even including the more raunchy stuff. Secondly, there's almost no outright hatred toward it. The person either ships them, or doesn't ship them. It may just be me, but for whatever reason I have yet to encounter someone who's straight out said OMG I FREAKIN HATE THIS SHIP OMG. It's either "AW MAN I LOVE THIS SHIP TOO" or "It's cool if you ship it. I personally don't, but that's fine." What's an omniship, by the way? As for Omniship, it is the entire Mane 6 being shipped together. Like, all together with each other, like polygamy? Equestria suddenly became a Huxleyan dystopia. Oh my goodness! I LOVE YOUR ART SO MUCH! im new to Deviantart but I have been following your work before I signed up it blows my mind how awesome your drawings are! I love the way you draw Applejack and Rainbow Dash! they look amazing along with all the others but those designs are definitely my favorite! Do you think you could draw an AppleDash Picture? I haven't browsed into tht ship alot but gosh,your art makes me want to go :SHIP RARITWII. As for your question, honestly, I don't think I have a character that I draw more often than the others. If I really think about it, I think the closest would probably be Rarity and Twilight. It isn't all that significant, how often I draw the two compared to the rest of the Mane 6, but I do draw them slightly more. I've already said, but this sketch is not done at all. Including the legs. They're like that because that's how I structure them before I "flesh" them out. fair enough, every one has his/her own way of sketching! But as i said, it's an awesome piece! My sister would write something for this...but fair warning, she'd probably genderbend Twilight. As for me, I'm just gonna enjoy your art. It's an interesting idea and I want to know more about it, especially Rarity's side of it. Their legs and bodies are a bit messy, but their expressions are wonderfully detailed. Anyways, I'll talk to my sis and see what she can do.